Gajalakshmi (Gajalaxmi) is one of apsect of the goddess Ashtalakshmi. Gajalakshmi is fourth aspect of Ashtalakshmi. In many photos she sits in padmasana posture on the lotus flower. Gaja means in sanskrit (samskrutham) elephant. Right site and left side two elephants pouring water with thair trunks. She sites in padmasana posture with four hands. In most images of gajalakshmi, she has four hands. 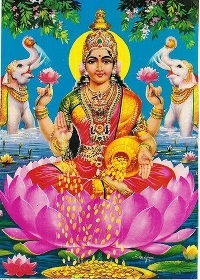 she pouring coins from abhayahastham and takes flowers with two hands.